On March 20, 2010 I made a short day trip to pick up the two trail cameras I had deployed three weeks previously on the Descending Ridge. I would usually have left the cameras out for another week or two, but I was leaving the next day for a four-night spring break bigfooting trip to the Olympic Peninsula (check back soon for details), and I wanted to have as many "eyes" with me on that expedition as possible. 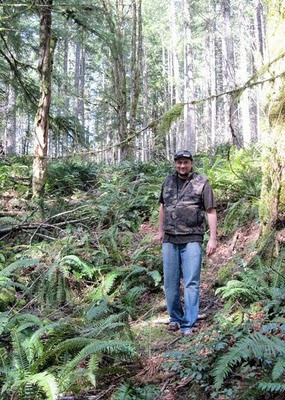 I was intending to go alone into the wilderness area where these cameras were left, but on a whim I called Guy Edwards of the well-known bigfoot blog, Bigfoot Lunch Club, to see if he was up for a short hike. He was, so I picked him up and we were on our way. The day was just about perfect with temperatures in the 60's and few, if any, clouds in sight. We arrived at the trailhead, scouted about for prints in the muddy areas adjacent to the parking area, and started trudging uphill into the wilderness area. My GPS was having trouble finding satellites that day, but using some memorable spots in the environment, we veered off trail at the appropriate time and located the first of two cameras without too much difficulty. The batteries were dead, so I had no way of knowing how many photos it took. We rested a short while and headed off to the south to find the other camera. The next trail camera was located at a choke point at the confluence of two small creeks that were fed by trickling seeps further up the mountain. This location was chosen not only because of the choke point, but also because of the possibility of finding footprints in the soft ground of the creek bed. When the camera was located, it also had dead batteries. I would have to wait until I returned home to see what treasures it held. 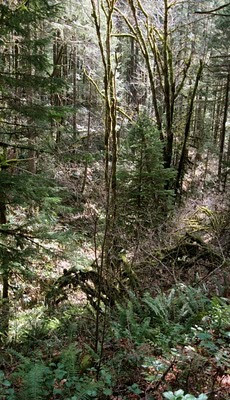 A view of our steep, overgrown path leading out of the wilderness. We cautiously made our way down the steep slope to a nearby road, which we followed back to the truck. We enjoyed a burger and a beer in Molalla on the way home. Later that evening I was disappointed to find that one of the cameras malfunctioned and recorded no images for the entire deployment. I had high hopes for that camera. I placed it on a ledge overlooking a wide area of heavy ungulate travel where any predator worth its salt would perch and observe for prey. I'll have to try that location again in the coming months. 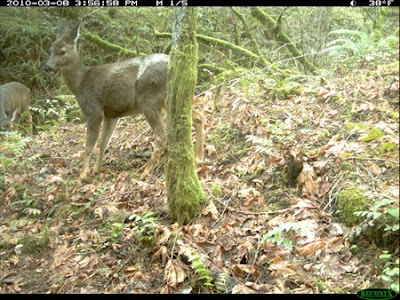 The camera located on the seep creek recorded a few photos of deer, one of which is shared below, as well as a number of false triggers set off by who-knows-what. This is another excellent spot for a camera, so I'll likely try it again next time I'm up there. Notice the other deer in the background to the left?